Sailing is an expensive sport and often requires a formal introduction at a young age. 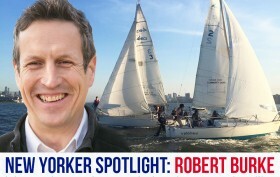 For many young New Yorkers, particularly those in underserved communities, the chances of getting this exposure are very limited, which is where Hudson River Community Sailing (HRCS) steps in. The eight-year-old organization’s Sail Academy in Chelsea teaches sailing to 150 students from nine public high schools in the neighborhood. The students enroll in a four-year program during which they earn math and science credit as they learn how to sail, study the marine environment, and build boats. In addition to its work with high school students, HRCS offers Community Sailing, where New Yorkers of all ages can come out and learn to sail. 6sqft recently spoke with HRCS’s Executive Director Robert Burke to find out more about this unique program and what students are learning on the Hudson, and more importantly, beyond it.